Stocks in Asia traded mixed Monday as doubts on the possibility for progress ahead of a potentially pivotal week for U.S.-China trade talks crept back into markets. Resurgent worries on global growth are driving bonds higher and threatening to dent this year’s rally in riskier assets, with stocks dipping last week. Equities rallied in China where exchanges reopened after a one-week holiday, and edged higher in Hong Kong. Shares in Sydney ticked lower along with those in South Korea. Japan is shut for a holiday, so Treasuries won’t trade until the London open after 10-year yields edged down to 2.63 percent last week. 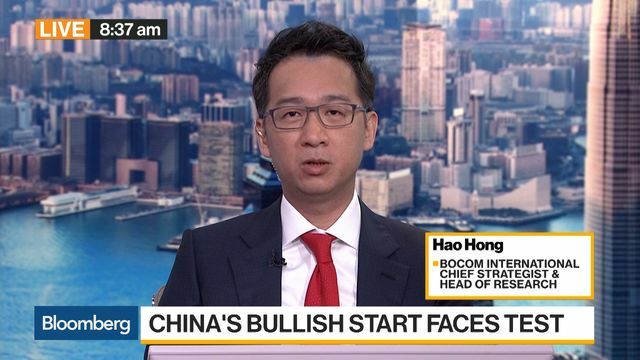 Hao Hong at Bocom International discusses China’s stock market as it opens following the Lunar New Year holiday. Earnings season continues with reports from companies including Vivendi, Nvidia, Cisco, Nestle, Coca-Cola, Credit Suisse, Michelin and Nissan. The MSCI Asia Pacific ex Japan Index was little changed as of 11:11 a.m. in Hong Kong. Hong Kong’s Hang Seng Index gained 0.3 percent. Shanghai Composite Index climbed 0.9 percent. Futures on the S&P 500 Index slipped 0.1 percent. The underlying gauge rose 0.1 percent Friday. The yen slid 0.2 percent to 109.92 per dollar. The offshore yuan added 0.2 percent to 6.7732 per dollar. The euro was flat at $1.1321. The British pound bought $1.2938. Australia’s 10-year bond yield held at 2.10 percent. The yield on 10-year Treasuries declined two basis points to 2.6375 percent Friday. West Texas Intermediate crude slid 1.2 percent $52.01 a barrel. Gold lost 0.2 percent to $1,313.91 an ounce.